First Author’s Institution: Dept. of Physics, Southern Connecticut State University, New Haven, CT; Astronomy Dept., Yale University, New Haven, CT.
Our galaxy is not alone. I don’t just mean that there are other galaxies in the Universe, but that there are other galaxies sitting right at our doorstep. The Milky Way is but one of 54 galaxies in our local group (Andromeda is one of these). Many of these galaxies are smaller, dwarf galaxies, and two of the closest and largest of these galaxies are the Small and Large Magellanic Clouds (visible by naked eye if you happen to live in the Southern Hemisphere). These two clouds are thought to be in their first orbit around the Milky Way galaxy, but have been interacting with each other for quite some time. Through tidal interactions, these two clouds have produced large streams of gas that can be seen in radio emission as shown in Fig. 1. 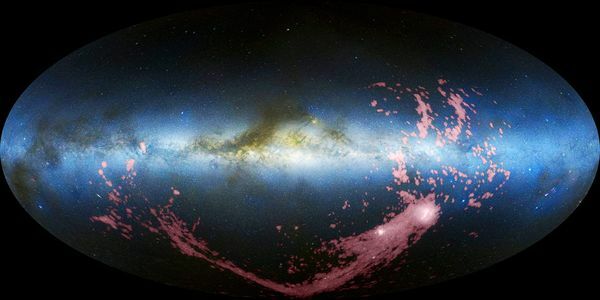 The long tail behind the two Magellanic Clouds is called the Magellanic Stream (MS), the gas connecting the two is known as the bridge, and the gas above and to the right the leading arm (LA). Astronomers expect the interactions between these two clouds and each other, and their interactions with our Milky Way, to induce star formation within the gas streams. The authors investigate this possibility by looking for young, hot, massive stars in the leading arm (again, to the right in Fig. 1). The authors find 42 stars that could be young stars associated with the leading arm. However, determining exactly what these objects are, and whether or not they are associated with the leading arm itself is not an easy task. The authors obtain spectra for each of these objects in order to identify the stellar type and their physical location. Fig. 2 shows a color map of the neutral hydrogen in the leading arm (whose different sections are labelled LAI to LAIV) overlaid with the candidate stars as crosses; the stars are spread between three separate groups labelled A, B, and C. Not all of the candidate stars will be young stars associated with the leading arm. The authors identify contaminating foreground stars by examining the composition of the stars obtained through the spectra. Many stars (22, the white circles in Fig. 2) are in fact foreground stars that turned out to either be small dwarf stars (subdwarf B stars to be exact) or white dwarfs. The rest of the stars (green circles) are the young, hot stars the authors sought. Of these, the authors confirmed that 6 were kinematically (based upon their positions and velocities) associated with the leading arm; these are denoted by red boxes in Fig. 2. These stars have temperatures ranging from 16,000 K to 17,200 K. 5 of these stars are young B stars, and 1 is a subdwarf B star. Given the kinematics of these stars, the authors rule out the possibility that this group of stars are “runaway stars” that actually came from the Milky Way disc. Of their entire sample, the authors find a very special star, marked by the black star in Fig. 2. This is an O type star (O6V to be exact), and has a temperature of 43,700 K, and a mass around 40 solar masses. This is a far younger, and far hotter star from anything else in the sample. At this temperature and mass, this star has a lifetime on the order of 1-2 millions of years. Given this very short lifetime, the authors rule out the possibility that this star came from the Milky Way (it would have to be at least 385 millions years old if it did). In addition, they rule out the possibility that it came from the Large Magellanic Cloud, as it would have to have an unrealistically large velocity to move from the Large Magellanic Cloud to where it is currently located. Because of this, the authors conclude that they have just discovered for the first time a star that formed very recently within the leading arm of the Magellanic stream. This young, hot star was born out of the interactions between the Milky Way galaxy and the two Magellanic Clouds, but exits completely independent of them. 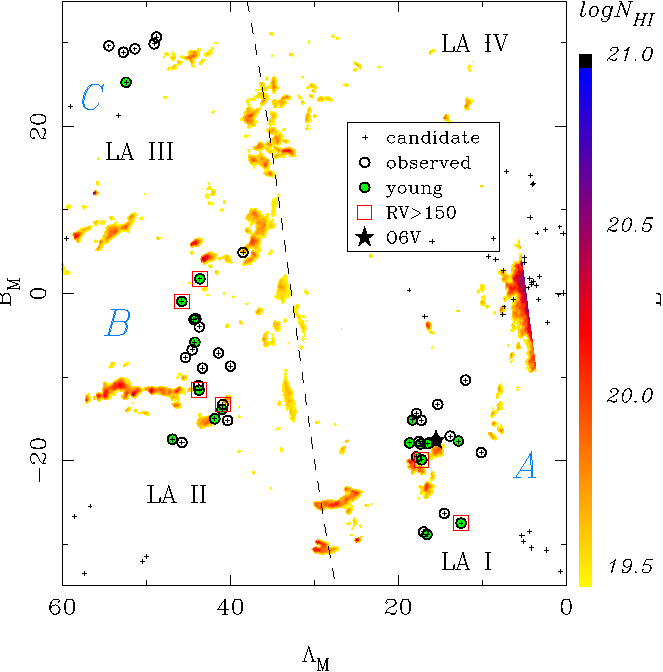 I don’t want to be a nitpicker, but the dots which denote young stars on fig.2 above are actually green, not blue! They both LOOK green (at least, on my monitor!) and are referred to as “filled green symbols” in the paper under discussion (where this figure is Fig.1, on page 7. Thanks for the catch! I’m not sure how I managed to do that (they are most definitely green, not blue). I made the correction. When I saw the title to this article I was really amazed. Finally stars have been found in the Magellanic Stream! Alas. What has been found is interesting – stars in the Leading Arm, which has been shown to have stars before. This is an interesting study and the discovery of the O6 star is fascinating – but this is not a discovery of stars in the Magellanic Stream. I apologize for the title. It was by no means my intention to sensationalize this astrobite! I had the impression that the Leading Arm was considered a feature of / substructure of the Magellanic Stream (hence the title). I realize now that this is not the case. Thanks for your comment and I apologize for being misleading.